I’ve since rerun the series with .308 Win Palma brass and small primers. A write-up will be done soon. Results are much closer than with the LR primers and again there was a ‘surprise winner’ (CBC Magtech 7 1/2). Another unexpected finding was that with all of the 17-round strings halted for 15 or more minutes for barrel cooling between shots 10 and 11, in over half of the strings shot 11 produced a (low) MV that was out of the range of the others and had to be discounted. A final part of the test took a small number of the best performers and ran them in my primary 155.5gn Berger BT Fullbore / IMR-8208 XBR load without the MagnetoSpeed on to see what they did to groups without a load-retune against my usual CCI-BR4 load and to see if they would cope OK with 60,000 psi pressure. Use the .308 Win Palma brass and small primers myself. Very interesting. Thanks. Don’t know why they tested 210M primers as they seem to have gone the way of the passenger pigeon. I know everyone has a favorite, and although they’re really tough to get, I would really liked to see the Wolf LR-M in that mix. The Murom KVB-7 or KVB-7M should be the Wolf LR-M under a different name. (Depends on whether the ‘M’ in the Wolf name is for Match or Magnum.) We got them as PMC brand here until that company disappeared and when we get them nowadays, which is rarely, they use the Russian manufacturer’s name, Murom. I have never looked at primers apart from reliability. This another thing to consider in shooting. Are Winchester primers still undersize? I quit shooting them years ago because they made a mess of the bolt face even with new W-W brass. Hi Laurie, your comment re S&B’s slack fit raises my question. How critical is the primer seating mechanism? Sometimes I hand seat with a Sinclair tool and sometimes I seat using the press. When I use the press the primers are seated harder.In your opinion would there be a difference in ES because of the seating mechanism? A good question Clive! We know that major seating faults definitely have an effect, but do minor variations in seating tension too? I suspect they have a minor influence, but that’s hunch not science! One (minor) reason that small primer brass may be better than many standard LR types is that it usually noticeably easier to seat SR primers and to get good ‘feel’ on their contacting the pocket floor. Where are S&Bs sold without paying to special shipment? Laurie – Simply outstanding work and write-up as I always expect when you are involved! Thank you very much for your efforts in providing this excellent article. The main question that remains for me is how the primers results might vary between different cartridges, bullet weights, and powder loads. 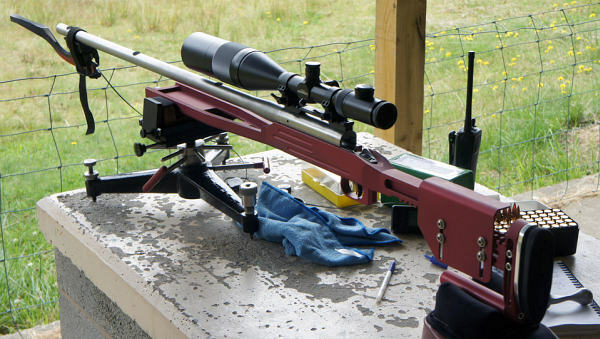 It has always been my impression that low ES/SD correspond to optimized combustion; that is to say when the primer, cartridge volume (pressure cell), powder charge, were all optimized to give optimal combustion for a given bullet weight. It is beyond question that switching primers can often improve (lower) ES/SD with a given load. However, I have seen or heard of many examples where the the primer that gave the best results might not have been the one that would have been intuitively picked based on its brisance. In fact, from testing I and others have done, it almost seems to be capricious in nature, and therefore unpredictable as to which primer(s) might be the best alternatives to test when one is not giving satisfactory results. 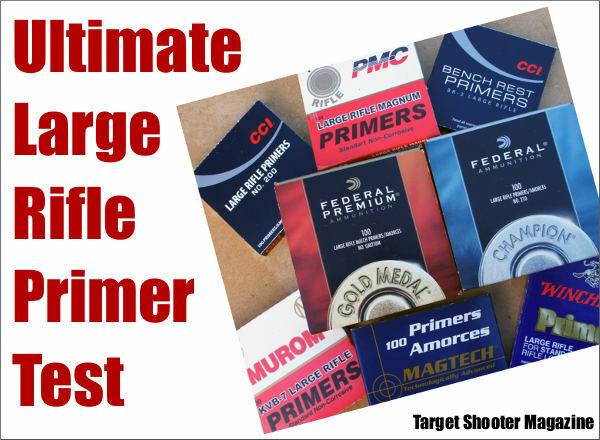 To date, the best I approach have seen is that it is wise to have several primers that cover a range of brisance and simply test them empirically to find the one that works best with a particular load. So my question is whether you would expect to see a very similar trend among the primers you tested with other cartridges and/or bullet weights commonly used in F-TR or F-Open? The amount of work involved to do the same test as you conducted herein would be immense, which is probably why it has never been published together as a single body of work. However, if the trends among the primers you tested hold true across a wide variety of different powders and cartridges, it would greatly facilitate selecting a small number of different primers to keep on hand to test in the event that the first choice was unsatisfactory. 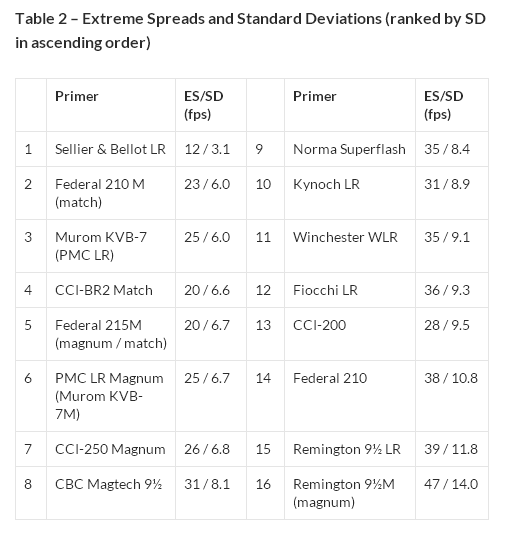 On the other hand, if some of the primers that gave poorer results in your testing with a specific .308 load gave much better results with a different cartridge/powder/bullet weight, it would be much more difficult to make any general predictions that might allow a reloader to keep a stock of only two or three types on hand, one of which would be likely to give satisfactory results over a wide range of cartridges and powders. I guess what my question boils down to is whether you think the range of primer performance you observed in your test here would carry over to other cartridges and powder selections. Any thoughts? Thanks again for the excellent write-up and work!